The united forces of Pars lay siege to the Keep of Saint Emmanuel and its Lusitanian defenders. Old friends become enemies as the prince’s warriors encounter the Parsian detachment loyal to Silver Mask. 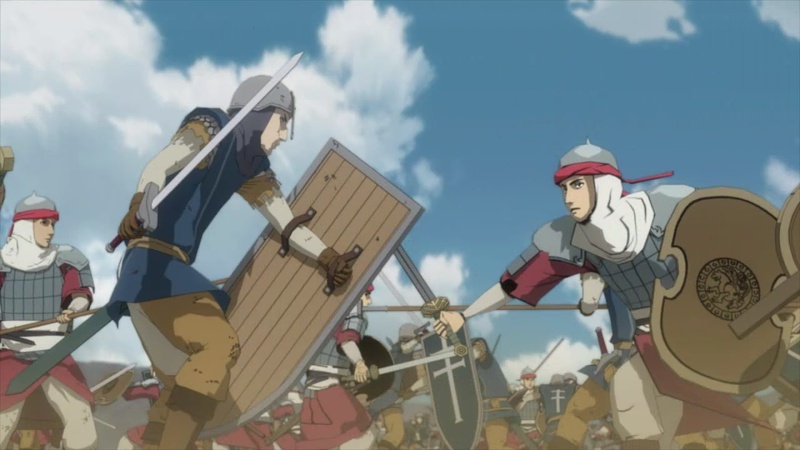 Amidst the chaos, Xandes charges forth to destroy Arslan’s camp and take revenge on Daryun. Elsewhere, Etoile also seeks to find Arslan and bring a decisive end to the conflict. 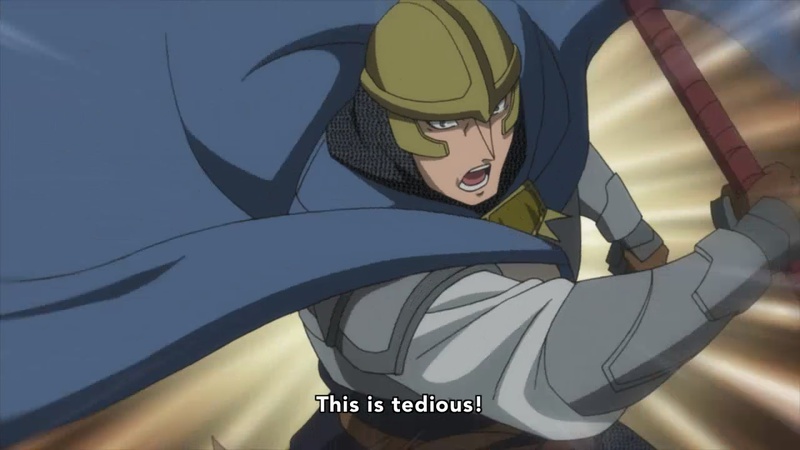 The Heroic Legend of Arslan has become very up-and-down for me lately. I greatly enjoyed the pre-battle planning in Peshawar and the two sides readying themselves for war in episodes 20 and 22 respectively, yet once the battle actually began, I found myself feeling let down. The episode has some high points, but the bulk of it was dry and uninteresting, which is not a good sign so late in the game. 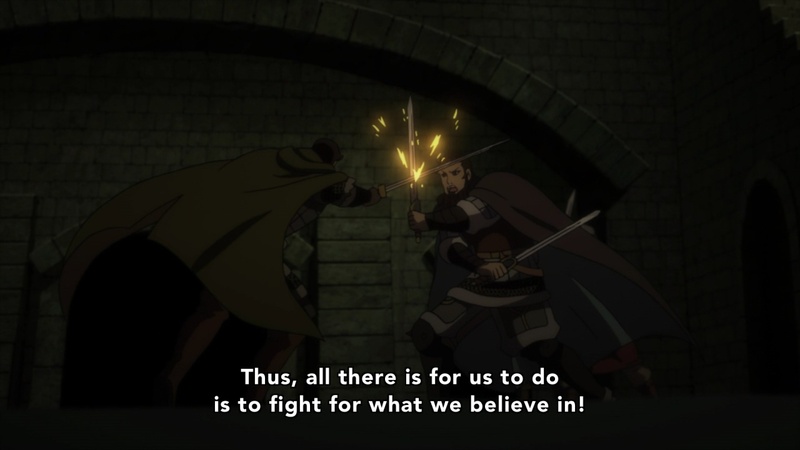 As the episode opens, we see Arslan giving orders to his commanders and laying out a battle plan; a welcome change from the usual machinations of Narsus, who acts more as an adviser in this case. It shows a little of Arslan’s development and resolution to be a true leader. While he is not on the front lines, he is making important decisions and doing the job of a military commander. I like this view of the prince, but by this point we’ve been seeing him as an impotent figurehead for so long that it’s a hard impression to shake, and his actions feel token. Once the battle is joined, things take a turn for the worse. The Parsians line up in front of the fortress walls and fire ineffectually at the defenders, almost a perfect reversal of the battle for Ecbatana so long ago. It’s all a diversion to hide a more cunning plan to infiltrate the keep, but it feels needlessly brutal and uncaring for someone like Arslan, who has spent the last several episodes talking about how much he wants to keep his troops alive. 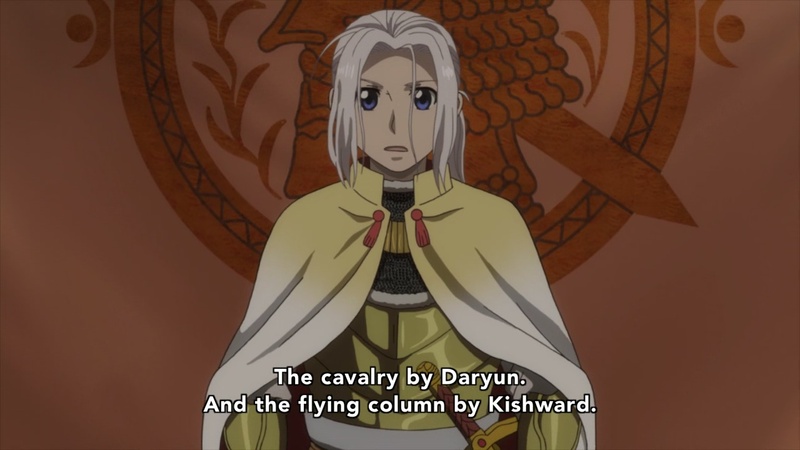 The Parsians are outclassed and demoralized (which is perfectly understandable), but after seeing them so easily win every battle since Narsus Arslan took command, it stinks of artificially stacking the odds. The battle itself is dull and unimaginative. Once Xandes and the Lusitanian cavalry charge, there is no sense of relative positioning or a cohesive battle line. The conflict devolves into individual scuffles between soldiers which are messily animated and serve little purpose than to pad out time between fights featuring named characters. Those fights aren’t much more interesting, and boil down to former allies shouting their respective motivations at each other while not taking obvious opportunities to strike. It all makes what should have been a dramatic confrontation a tedious waste of time. A perfect example of how disconnected the scenes throughout the fight are from one another is when Etoile (who we now know is a girl hiding her identity to fight for Lusitania) takes to the field. She fights several Parsian cavalrymen, is unhorsed, then wanders off, the main fight nowhere in sight. 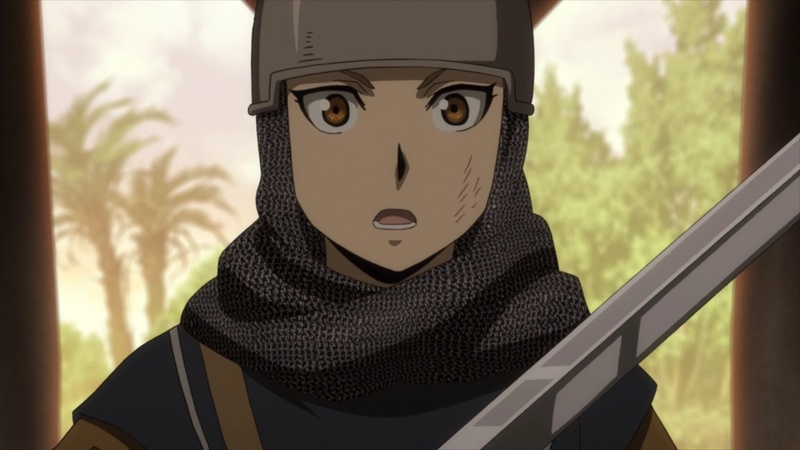 Later, she and a group of Lusitanians manage to reach Arslan’s command camp with no clear explanation of how they found it or where they came from. 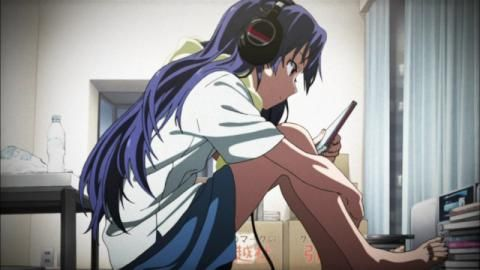 It does, however, lead to her seeing Arslan and finally realizing that he is the young boy she met years ago. Despite its shaky sequence of events, this is the only part of the episode that promises any sort of interesting payoff later. As a side-note, I’d like to talk a bit about Xandes and his conflict with Daryun. First, I know Xandes carries that enormous mace to show how strong he is, but it is ludicrous when compared to the more reasonable weapons 99% of the cast wields. Second, his duel with Daryun just looks plain silly, as the two of them just sort of wave their weapons at each other and shout. Finally, even discounting all of that, Xandes is such a bland character that he feels like a waste of Daryun’s time. I’ve been very harsh on this episode because it looks cheap and feels soulless. The battle looks like a low-rent version of any quasi-medieval conflict you’ve seen on film in the last 15 years, and the characters’ actions are all so predictable as to be boring. With no sense of flow, the entire fight seems like a big time-wasting blob instead of the beginning of the show’s climax. I’m hoping that Arslan can hold onto his newfound growth and be the leader everyone wants him to be, if only to give the series some heart at the end. 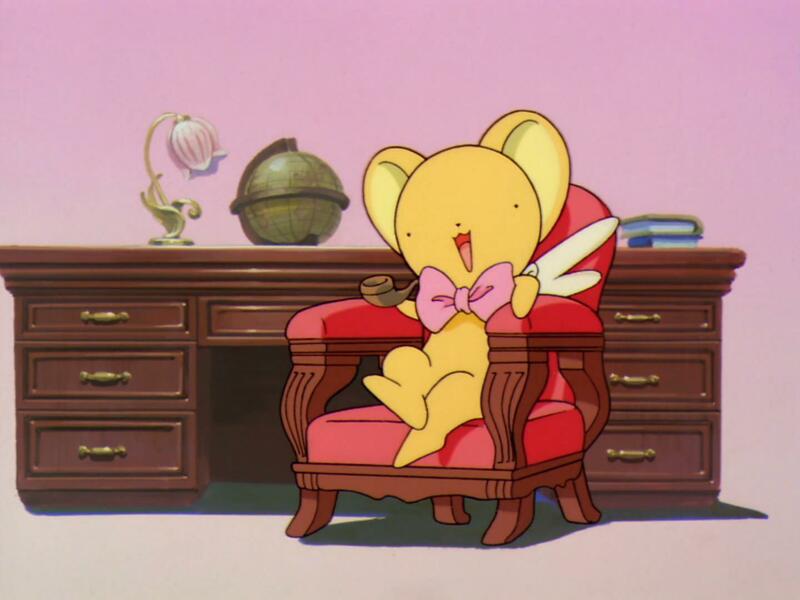 Perhaps his encounter with Etoile will produce something worthwhile. Tune in next time to find out. C’mon Etoile, I’m pulling for you! Be interesting!